The new paradigm in corporate leadership: How do you allocate your time and energy? Today, leadership is the job of many – with everyone wearing three hats simultaneously. As a Producer, your mindset is “self.” Your focus is on high-level tasks, such as closing deals or developing politically crucial relationships. As a Manager, your mindset is “team.” Your focus is on operations or what John Kotter calls the “left-side” of the company – the activities that enable and measure outcomes. As a Leader, your mindset is “future” and “culture.” Your focus is on people and engaging their hearts. How to create meaning and purpose in their work that goes beyond profits. 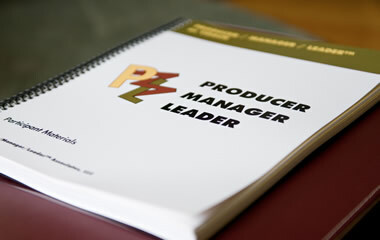 With the Producer/Manager/Leader® series, you and your business leaders will learn the right way to allocate time between these three roles. The result is increased performance and effectiveness for greater business success.